This is one of those books I do not want to say all that much about purely because I don't want to say too much and spoil it. 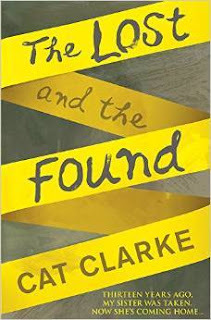 I have come to expect awesome things from a Cat Clarke Novel and this book was no exception. It is fast paced and kept me guessing through to the end. I really liked the main character Faith as she comes to terms with the return of her big sister who was kidnapped years previously as a child and is returned to the family as a young adult. It was interesting seeing the two develop a relationship after Laurel's return after being missing so many years. The role of the media in this book is interesting. It has a lot to say about they can both help and hinder situations in their wanting to get the story out there. Special mention has to go to Michel Faith's step father and possibly the coolest step parent I have ever read about in a novel.I loved the relationship they are as all too often step parents are portrayed as almost evil and cast as a baddie of the piece. About to start this one and after reading this I'm even more excited to get reading! Great review. I still haven't read any Cat Clarke novels but the premise of this one really intrigues me.